Cargotram is a service transporting freight on the tram network of Zürich (Switzerland). This page is intended to provide at-a-glance information on this service, aimed primarily at the transport enthusiast, but may also provide a starting point for professionals and planners. For an introduction to the concept, this 2003 article may be of interest. Search news archive for cargo and E-tram. Goods operation by tram in Zürich began in 1898 when mail was carried between Zürich and Höngg in a special trailer hauled by a passenger-carrying tramcar. Ventures to carry different types of goods came and went over the years. These include beer from Dietikon to Zürich from 1900, refuse to a landfill in Heuried from 1921 (this idea was short-lived), groceries to LVZ shops (now Coop) from 1941 to 1945. The final service to be discontinued was the goods service from the Forchbahn which ran through to Tiefenbrunnen where a transfer shed existed to the main line railway. The fleetlist is dicussed in the news item of 4th May 2005. Cargotram services are typically formed Xe4/4 + X2 + X4 and E-tram services Xe4/4 + X2 + X2, with the X2's using different bodies for these different types of services. There is no rule without exception however. 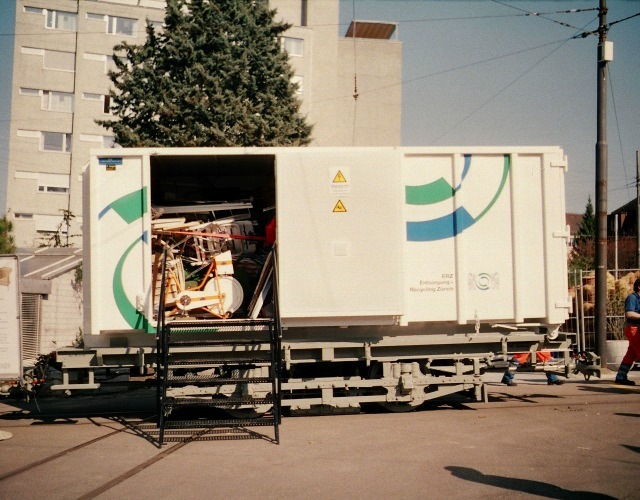 Cargotram — Zürich's domestic refuse takes to the rails, first published in T&UT, August 2003. See the cargotram section of the picture gallery. A video showing rubbish being loaded at Hirzenbach, the tram passing through Schörlistrasse on the Schwamendingen subway and at the end of its trip, pushing back into the ERZ yard at Werdhözli (added January 2011). And much the same footage as above but with a humorous soundtrack, for those who remember Oscar the Grouch (added January 2011). Cargotram reversing out of Burgwies depot (added July 2009). Notice: the following link is to an external website: Cargotram. In Vienna, there are plans to introduce a freight tram service. A prototype has been built but this is currently restricted to internal use (supplies to the operator's own depots) and does not appear to be undergoing further development. Various Dutch cities are planning freight tram services. Of these, the plans of Amsterdam are most advanced. The Amsterdam project was abandoned in 2009. In 2004, SNCF (French railways) proposed a freight tram for the distribution of goods in Paris. There does not appear to have been any further development. Search the news archive for important developments in these areas. To follow discussions about cargo trams and works trams (in German), join the cgtr Yahoogroup.